Realme 3 poses strong figures in both online and offline sales. Its sales hit 900% growth compared to its first ever in-store sale last year. Realme poses 900% higher offline sales compared to last year's first ever in-store sales record. This feat came from the heals of success of the company's back-to-back sold-out record on Shopee. In fact, the Realme 3 was hailed as the fastest-selling smartphone under Php 10,000. 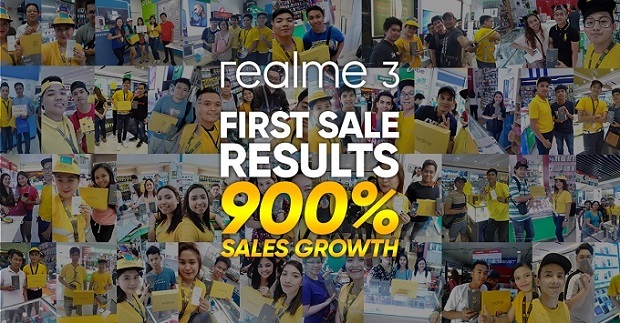 Realme Concept Kiosks and authorized stores nationwide were filled last April 6 with customers claiming their pre-ordered Realme 3 smartphone as early as March this year. Pre-order customers were able to get freebies worth Php 1,299. The Realme 3 packs a Helio P60 processor used by more expensive smartphones, dual AI cameras with Nightscape and Chroma Boost modes, and large-capacity 4230 mAh battery for all-day performance, all in a gradient unibody design for a stand-out style. These features are normally found in smartphones above Php 10,000, but Realme was able to provide these for as low as Php 6,990. The flagship variant 4GB + 64GB variant is now available in stores nationwide for Php 9,990. Customers who pre-ordered the 3GB + 64GB variant can claim starting April 13, 2019 and still get freebies worth Php 1,299. To find out where to buy the Realme 3, visit http://bit.ly/RealmeMaps. Check out the Realme 3 Full Specs here.